DURABLE, lightweight stainless steel 3 piece cutlery set (spoon, fork & knife). Great for traveling. WASHABLE CASE: Handy for office, car, camping, scouts, caravanning, holidaying and more. LIGHTWEIGHT – only 85g. Great for travelers and carrying in your bag or backpack. 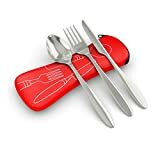 Always be ready for a meal on the go with this 3 piece stainless steel travel cutlery set featuring a spoon and fork along with a choice of either a knife or chopsticks. Whether you’re traipsing around a city, hiking in the mountains, enjoying a picnic in the local park or on your lunch break at work, you can rely on these top-quality utensils wherever and whenever it’s time to eat. Plus, having this durable cutlery set on standby ensures you won’t have to settle for one of those flimsy plastic forks ever again! Presented in a stylish neoprene pouch, your cutlery will be kept clean and compactly stored throughout the day – so it won’t rattle around in your bag. This cutlery is part of a unique new range of innovative travel kitchenware by Roaming Cooking that’s specially designed to be multi-purpose, lightweight, compact, durable and eco-friendly.